Manchester City loanee Olarenwaju Kayode has averaged 0.5 goals per game for Shakhtar Donetsk after netting the winner for the Ukrainian powerhouse in their 1-0 win at Mariupol on Friday. The Nigeria international was delighted to get on the score-sheet and with the win, and has explained why he ran to celebrate with manager Paulo Fonseca in the 65th minute after scoring his third goal in Ukrainian football. ''The match was not easy at all, the coach warned us about that. 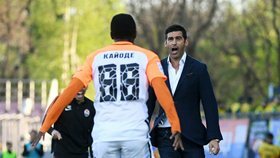 We tried our best to win it, and most importantly, we earned the three points,'' Olarenwaju Kayode told Shakhtar's official webpage. ''Why I ran to the coach after scoring the goal? Paulo Fonseca is one of the best coaches, he developed an effective playing system that really works. ''I think we deserved this victory because we fought together. So far, I can’t compare myself to the top scorer Facundo. Kayode could bid farewell to Manchester City if he impresses for the remainder of the campaign as Shakhtar Donetsk inserted a purchase option into their agreement with the English champions.